When you listen to Furtwängler conduct you feel that the music is being worked out in the performance. He takes you from the silence before the first note to the silence at the end after the final note in a way that can’t be described by any exact terms. You can say the same thing about the Christian life, or the Christian life as it is lived by the masters of living… by some of the saints, for example. This life can’t be described by formulas, or by any do’s and don’ts. The Christian life at its most authentic is a life that is being worked out in the process of living. It’s all about becoming. It’s a life of connectedness. Chapter 11 of the Letter to the Hebrews names many saints of ancient Israel and concludes with these amazing words: “And all these, though well attested by their faith, did not receive what was promised, since God had foreseen something better for us, that apart from us they should not be made perfect.” Apart from us – apart from you, apart from me! – they are not made perfect. That’s the connected life. The saints of the past are connected to us and we are connected to them. A month ago I had quoted an article from the Washington Post about what millennials look for in churches. One millennial was quoted saying: “At church, I do not want to be entertained. I do not want to be the target of anyone’s marketing. I want to be asked to participate in the life of an ancient-future community.” An ancient-future community! That’s about the most genuine description of what a church ought to be. We Orthodox are good at the “ancient” part. We’re good at honoring the saints and feeling connected to them and the glorious history and theology of the church. We’re good at that. What we’re not so good at is the “future” part of that “ancient-future” continuum. Is that because vision is lacking in our churches? In our leadership, in our clergy, in the people who come to Liturgy as passive participants? Perhaps the key is to acquire this sense of connectedness – not only with the past, but with our daily lives, and our hopes and aspirations. Is the Liturgy an isolated moment of inspiration, a spiritual high in our weekly routine? Or is it part of a connected life? A life in which every hour of the week becomes liturgy, becomes a vision of our connection to Christ! That would be a start toward becoming an ancient-future church. Remember, the church is people, not an institution. Every single one of us is an essential member of this mystical organism called the church. Let us practice connectedness with each other. Let us practice connectedness in our own lives. Let us begin to heal the disjointed life that has become normal for most of us in this disjointed world. Let us see the worth of our existence and find the light of Christ’s presence in everything we do. Let the Liturgy be a guide for the whole week, not simply the spiritual hour of our weekly routine. Let each of us visualize his or her life as a symphony! 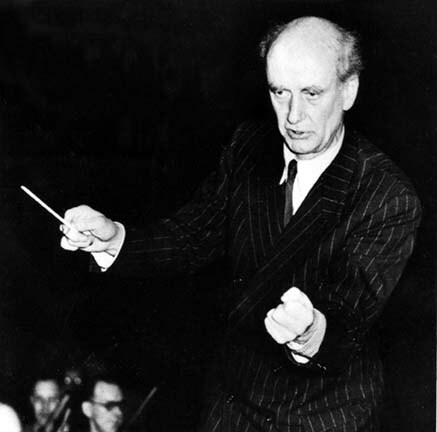 No one conducted the great symphonies like Wilhelm Furtwängler did. He was a master in the art of connectedness and transition. His was the art of becoming. And that is also the art of the connected life. Here is a powerful performance of Beethoven’s 3rd Symphony, the “Eroica” recorded live in 1952. Furtwängler conducts the Berlin Philharmonic in this live performance, and I’m so glad that no applause was included at the end. The silence at the end is the gift of perfection. In every performance of this symphony I look forward to that dionysian moment in the final movement where the music simply takes flight. Furtwängler is quite magnificent in that moment, which starts around the 46:10 mark and takes off at 46:40. But the entire performance is an amazing demonstration of connectedness, the mystery of becoming. Let us strive to become that ancient-future community that some people are looking for. Let it be a project in which all of us participate. Let us start building the “future” part of that “ancient-future” vision. Categories: Global Visions | Tags: Christian life, Eroica Symphony, Wilhelm Furtwängler | Permalink.